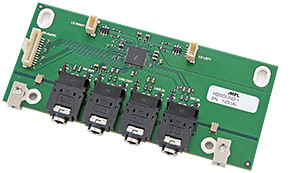 The HDSound module converts the Intel HD Audio bus into the standard PC analog interface signals Line-In, Line-Out, Microphone In and Headphone Out. Also a 2 W stereo speaker output is available. 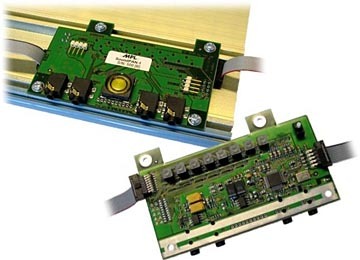 SoundPAN-1 is designed for Products with an AC97 Interface. It is based on an AC97 Audio Codec, which features full duplex stereo ADCs, DACs, and analog mixers. If the SoundPAN-1 module is mounted in a PIP, "Stereo Line In", "Mono Microphone Input", "Stereo Line Out" and "Stereo Headphone" are available on the PIP-Front1. "Stereo CD In" and another "Stereo Aux In" are internal available. A small mono speaker is mounted onboard. This speaker turns off automatically by connecting a headphone or by connecting the Line Out jack. All external connectors are protected against ESD.